With its "unique and virtues of national food" Georgia ranked fourth among the 48 European cuisines following Italy, France and Spain in the Thrillist's list. Georgian cuisine refers to the cooking styles and dishes with origins in the nation of Georgia and prepared by Georgian people around the world. The Georgian cuisine is specific to the country, but also contains some influences from other Middle Eastern and European culinary traditions, as well as those of the surrounding Western Asia. The cuisine offers a variety of dishes with various herbs and spices. Each historical province of Georgia has its own distinct culinary tradition, such as Megrelian, Kakhetian, and Imeretian cuisines. In addition to various meat dishes, Georgian cuisine also offers a variety of vegetarian meals. 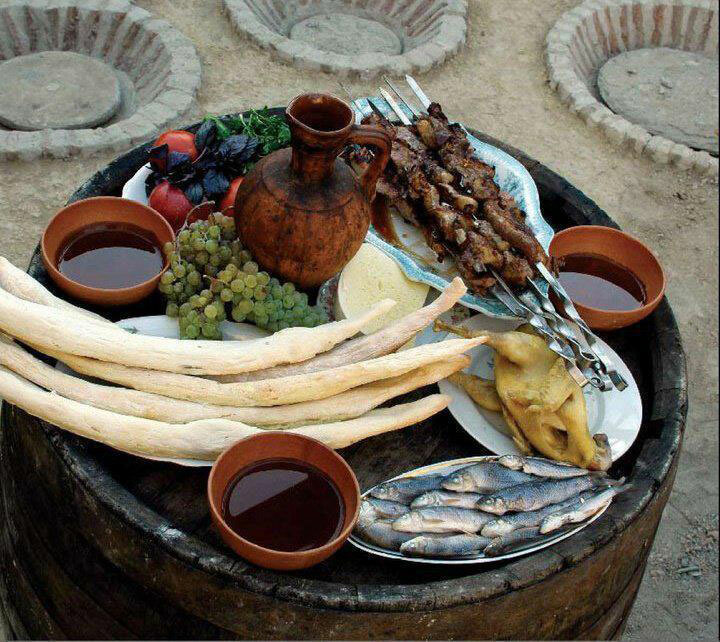 The importance of both food and drink in Georgian culture is best observed during a feast,or supra, when a huge assortment of dishes is prepared, always accompanied by large amounts of wine, and dinner can last for hours. In a Georgian feast, the role of the Tamada(toastmaster) is an important and honoured position. "Badrijan Nigzit"-roasted eggplant strips, served flat and topped with walnut paste. Sweet and savory,it’s one of Audrey’s favorites. "Kuchmachi"-the most popular hot snack, a dish from boiled chicken stomachs with nut sauce. "Khashi"-is very fat and strong broth prepared from the beef feet and a stomach. Crushed garlic and dried lavash are served separately.There exists quite a just opinion that ”the onion soup in Paris and the Khashi soup in Tbilisi serve the same purpose. "Kharcho"-is a soup from beef with rice and walnuts on a special sour basis — "Tklapi".It is possible to replace Tklapi with a fresh cherry plum, sauce "Tkemali", pomegranate juice or tomatoes and tomato-paste. “Chakapuli”-this is another popular slow-cooked dish, It is made from onions, lamb chops, dry white wine, tarragon leaves, tkemali sauce (plum sauce), mixed fresh herbs (parsley, mint, dill, cilantro), garlic and salt. Sauces are the special pride of a Georgian cuisine. The Georgian cuisine offers a wide choice of hot and soursauces: different types of "Ajika" from hot pepper. "Satsebeli"-from tomatoes, sweet pepper and crushed walnuts. "Baji"-a very spicy special holiday sauce from crushed walnuts with garlic and wine vinegar, served with meat and fish. "Kindz-dzmari" is served with boiled white fish. The name consists of words «Kindz» — Kindza (a type of greens), and «Dzmari» — vinegar. To prepare this sauce it is enough to cut Kindza (greens), add salt and wine vinegar. "Khinkali "-is considered a special dish. It is very juicy big ravioli from mutton, sprinkled with salt, grinded black pepper, and greens. Khinkali are eaten with hands. They are usually served as a main and single dish, and such a feast is called «Кhinklaoba» — «festival of Khinkali». Vodka is drunk during «Khinklaoba». "Mchadi" and "Lavash" are widely used in Georgia as bread. "Mchadi"-are flat corn cakes baked in oven (so-called "bukhari") in a special ceramic pan.Sometimes bread is replaced with vapid corn porridge ("Gomi"). "Khachapuri"-in Georgia is made with every possible stuffing (for example, "Rachian Khachapuri" is filled with string bean «Lobiani». "Kubdari"-khachapuri-like dough stuffed with small chunks of meat, spices and onions. A Svanetian specialty. The place to get it is the restaurant/stop between Zugdidi and Mestia or at a home stay along the route from Mestia to Ushguli.